I needed at least one Thanksgiving bento to post, so we made one today! Everyone loves a cute turkey, gobble gobble. I am running on a low food count, since it will just be the 4 of us and a large turkey for Thanksgiving. I know I'm going to have a million leftovers, so trying to use out as much as I can without buying more before Thursday. Today, we have turkey & onion/chive cream cheese sandwiches on multigrain sandwich rounds, topped with a cheese turkey! The feathers are alternating cheddar and swiss pieces, cut with a circle cutter twice to make the feather shape. The face is also cheddar, using part of a duck cookie cutter I have, the beak & waddle are swiss from the same cutters. Two sugar eyes make for a happy smiling turkey. To the top, we have strawberry slices & grapes; to the upper right, some blackberries; and on the bottom right, honeydew, cantaloupe and watermelon. We had a birthday dinner the other night with lots of fruit leftover, so F&B are enjoying a huge variety right now. Lunch is packed in our EasyLunchboxes, I love the large space when I want a cute sandwich design. Sounds to me like you have just the right amount of turkey. I have to have leftovers! Love this Shannon! So sweet that you're cooking for just the 4 of you and making a big deal for your own family. Happy memories! 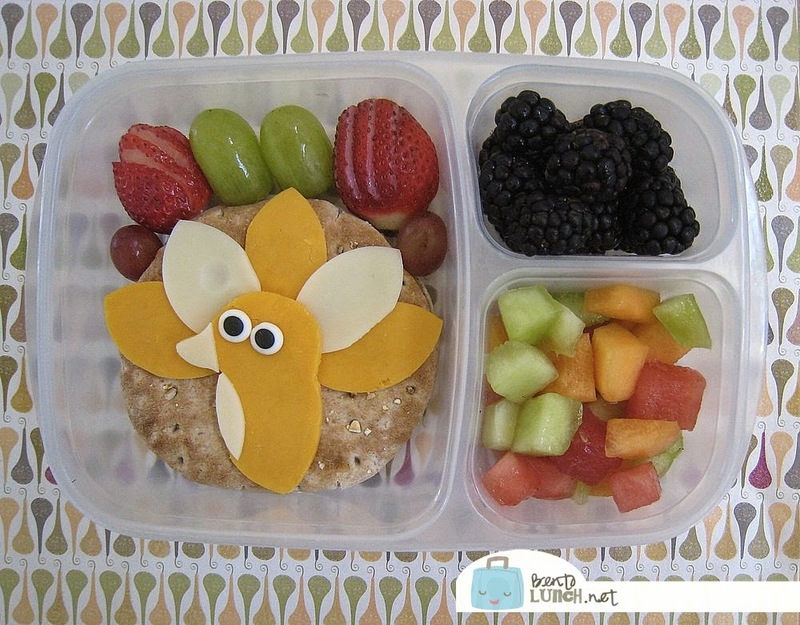 This is such a cute bento idea! Happy Thanksgiving! Did you use cream cheese to secure the design? Yes. I usually use dots of it to hold designs down.